Llareggub, Welsh Noh, and me. I’m currently deep in Dylan Thomas territory – the hype, history, and cultural tourism created about the man. I’ve been invited to write an essay on Dylan Thomas by that literary mountain of a man, Jon Gower, who is editing a collection. There is much noise being made about legacy in this centenary of Thomas’s birth, and especially so when living where I do, close to where he spent the late war years, 1944-45. Some weeks ago the nature poet Chris Kinsey and I took ourselves off for a wander around Newquay, Cei Bach, and St Ina’s Church at Llanina Point in Ceredigion. It’s my local walk, but we were doing it as a literary pilgrimage, following the blue plastic plaques and local hearsay about where Dylan Thomas walked, talked, wrote, and (most importantly for the commercial impact) drank. I have to confess, I hate ‘The Dylan Thomas Trail.’ These strangely marbled plaques bearing the face of a young Dylan Thomas decorate the odd tree or wall, leaving me mystified as to the locality’s significance. There’s no nearby information and the ‘map’ which the literary curious are supposed to follow to decipher the import of each place wasn’t available and the tourist information office was closed. The information boards around Newquay aren’t much better. They’re fine for the day trippers to glance at when licking an ice cream on a sunny August bank holiday, but they can’t hold their own against the posters advertising the wild porpoises and bottle nosed dolphins who visit these parts. I also find the ‘facts’ about Thomas so bland as to render any detail invisible. Sure, the local tourist board may not want to go into his drunken exploits and womanising (although that seems to be what everyone wants to discuss), but his literary legacy and strong connection between creativity and place could be drawn a little clearer. Newquay is reputed to be the inspiration for Llareggub (say it backwards), the marine town in ‘Under Milk Wood’, although the Thomases walked, bickered, and drank a longer trail, up to Tal Sarn and Llanon, further up the coast. So we took ourselves out across the beach at low tide in a wind blowing itself up into a gale, shivering in the February drizzle. Poor Chris was incubating a stupendous cold and wading about in the fresh springs that flow across the beach and into Cardigan Bay mustn’t have helped. We walked up to St Ina’s Church, one of my favourite spots in Spring, when the graveyard and surrounding wood overlooking the sea is filled with bluebells, nodding my approval as always at the revision of one of Thomas’s most famous lines on a headstone by the gate: ‘Go gentle into that good night.’ Chris also shared my enthusiasm for the rewrite, saying on a personal level we wouldn’t want a loved one raging into death. Writing the essay for Jon has refreshed my relationship to where I live, and reanimated my thoughts about language. characterisation, and playwriting. My focus has been on ‘Under Milk Wood’ and it has been a pleasure and education to revisit this text, especially when in the shelter of one of the nooks in Newquay harbour, ostensibly in the shadow of Captain Cat’s house. I’m off to give a last polish to my essay on Dylan Thomas, then head out to Cei Bach to walk along the golden sand and look across to Llareggub/Newquay in this sudden welcome Spring sunlight. 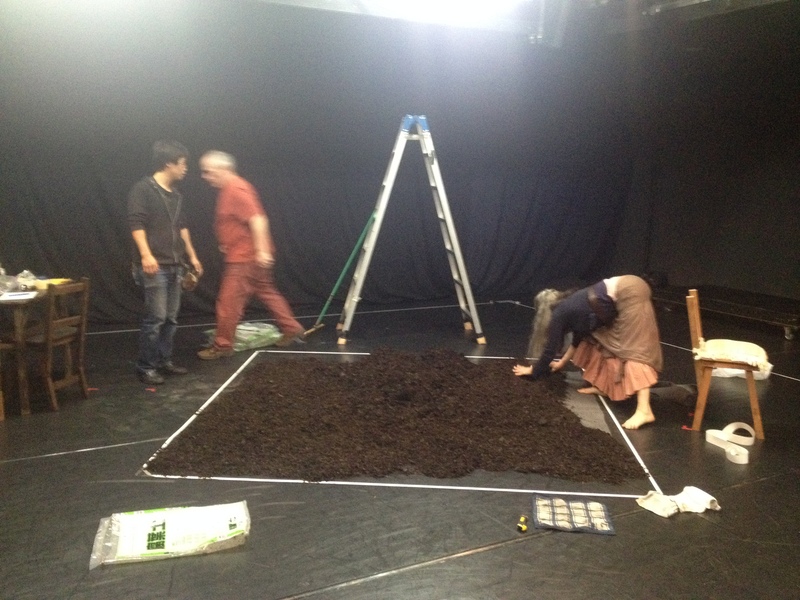 When Takayuki Kako, the stage manager of Babylon Theatre Tokyo asked us what our preferred procedure would be if there was an earthquake during one of The Llanarth Group’s performances, I knew I was a long way from Ceredigion. Our safety was his priority, he told us, but tremors were frequent. Would it be best if he stopped the show if he thought any potential quake was dangerous, to lead us and the audience to safety? Yes please, I said, explaining that although I was running the show, I had limited experience of earthquakes and so might not be the best person to lead an evacuation, especially as I don’t speak Japanese. 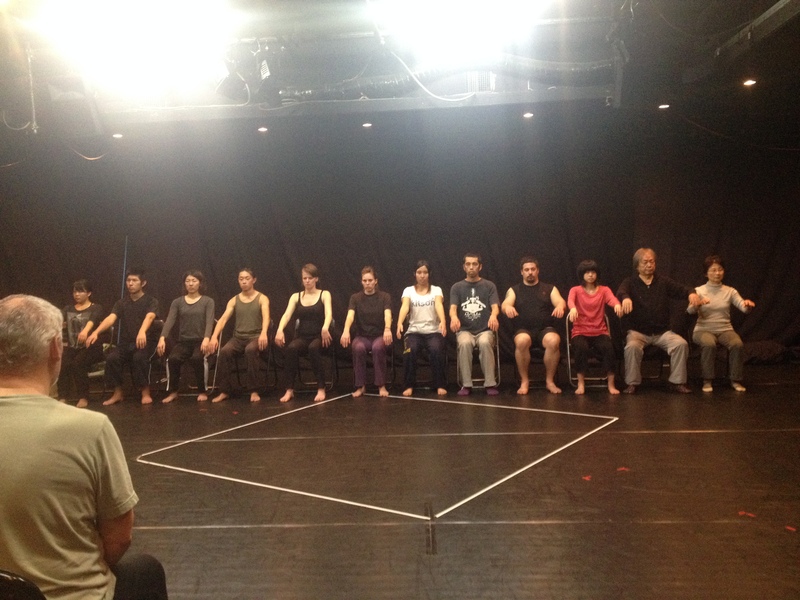 We are here in Tokyo on a cultural exchange with Ami Theatre, sharing a repertoire of work at Babylon Theatre and exchanging approaches to training and performance work. It has been a week of intense exchanges – workshops with Ami and students of Sophia University, the get-in, dress rehearsal, and the Tokyo premiere of ‘Told by the Wind’. Throughout, we have been dealing with jet lag, never quite getting into the local timezone as our work has been in the evening. At night when I fall into bed, my tiredness dissipates into a whirling brain matching the speed of the spin driers in the 24 hour laundry room directly below me. For some inexplicable reason the opening lines of Elvis Costello’s ‘Tokyo Storm Warning’ – which I haven’t heard for twenty years – plays on loop in my head. I’m happy to say my own experience has been infinitely better than that in Costello’s lyrics. 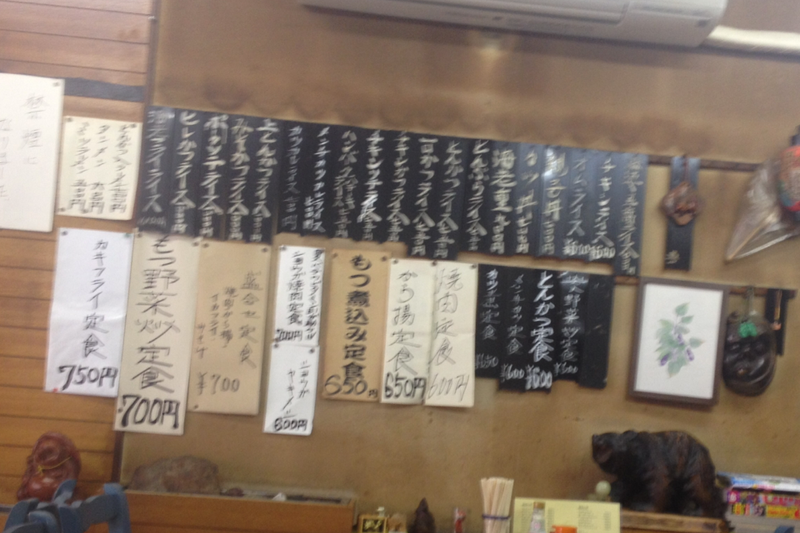 We aren’t in the centre of the metropolis, but in a quiet neighbourhood in the north of the city, passing the Shinto shrines and the temple on our daily journey between our capsule hotel and Theatre Babylon. Yesterday, on a short break before the dress rehearsal, I wandered down to the temple and stood in the calm, breathing, marvelling that such peace could be found in such a large city. Around the small back lanes people glided by on bicycles and a company of fat, contented cats lazed in the sudden sunshine. I marvelled also about the people we are working with – the staff at Babylon and Theatre Ami are so generous, kind, and talented. We all feel immensely fortunate to be here in this collaboration. 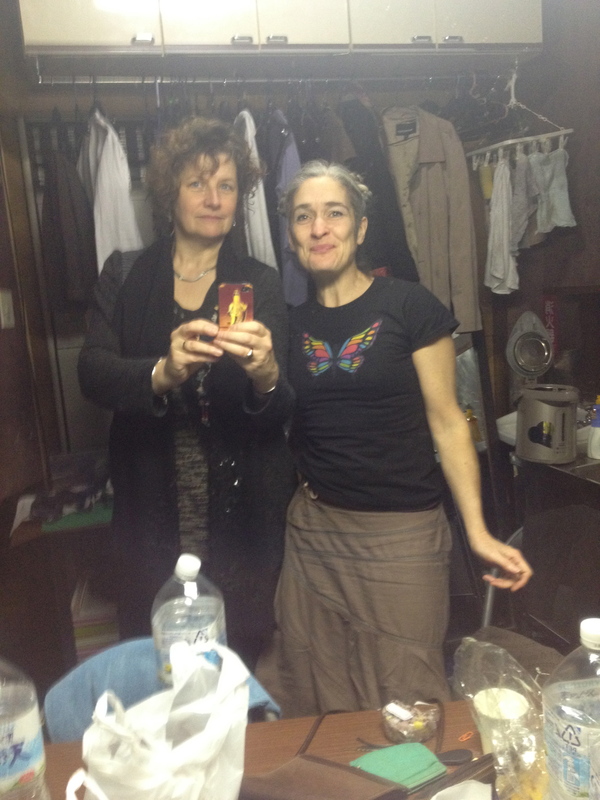 It has been great working so closely with scholar and translator Mari Boyd here in Japan. She was an artistic advisor on ‘Told’ in its final rehearsals and was with us for the premiere in Chapter arts centre in Cardiff in 2010. 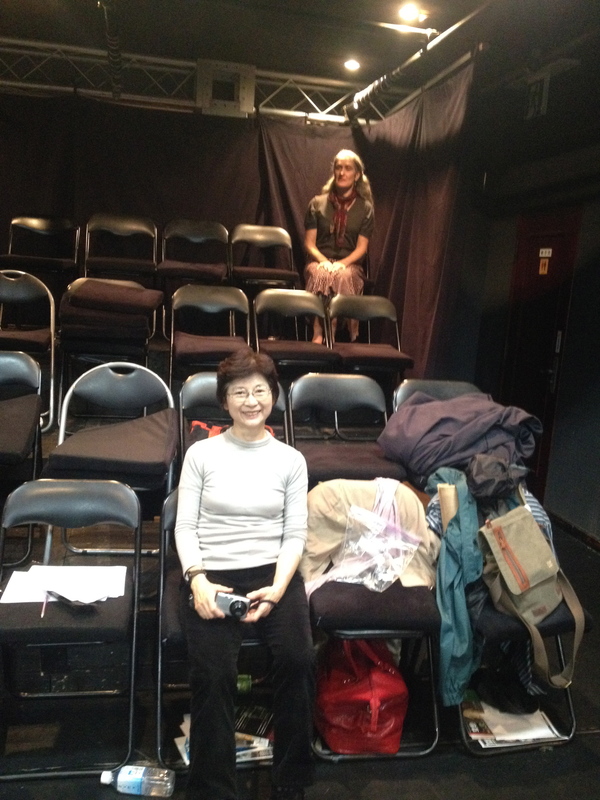 Bringing us here was at her instigation, as she felt this piece, with its influences of Noh theatre and Quietude, would be fascinating to present here – for us from outside the culture, and for audiences and academics within. The responses to the work have been extraordinary, the audiences attentive and appreciative, but that will be content for a different blog. And then suddenly the horrendous typhoon devastated the Philippines – and the weather warnings went up, as the storm seemed to be heading our way. After two successful performances in one day, we headed for bed and the threat of torrential rain and 100mph winds the next day. The Elvis Costello song on loop didn’t seem to be so funny now. Then at 7.38am I’m lifted from my bed and deposited quite gently onto the floor. I sprawl, feeling everything move beneath me in a calm circling motion. It is not unpleasant – similar, I imagine, to a bird riding a thermal – and just as I am beginning to question whether the earth really should be moving like this, and the building swaying quite so seductively – it stops. Not one of the technical team mentioned anything about the quake when we went in for the matinee, but the Japanese Meteorological Society put the tremor at 3-4 on the richter scale, so it was not insignificant. But like our hosts, we just continued, Jo and Phillip performing, me calling the lighting and sound cues, and the audience attending, despite threats of typhoons and possible aftershocks, or any other form of storm warning. 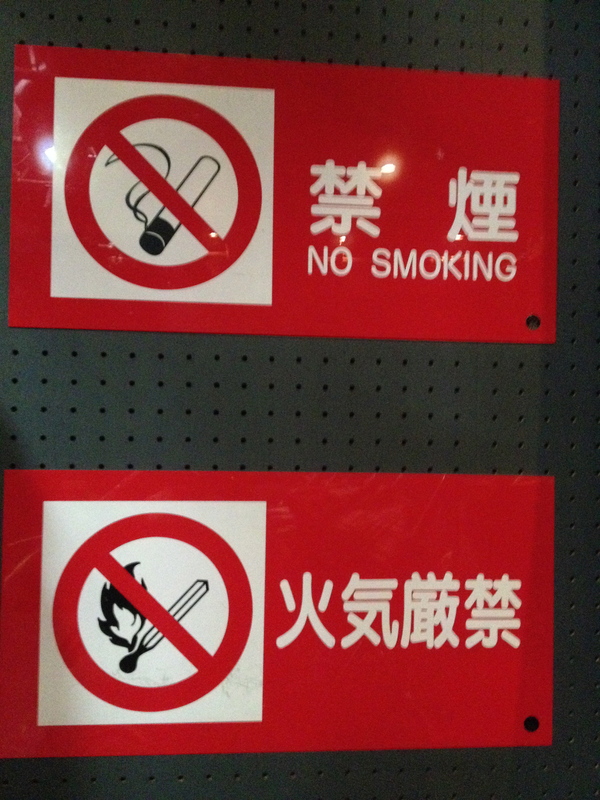 The Llanarth Group are in Japan thanks to Wales Arts International and the Daiwa Foundation. note: If any advertisement appears on any of my blog posts, please know this is not at my instigation or with my consent, but beyond my control, enforced by wordpress. 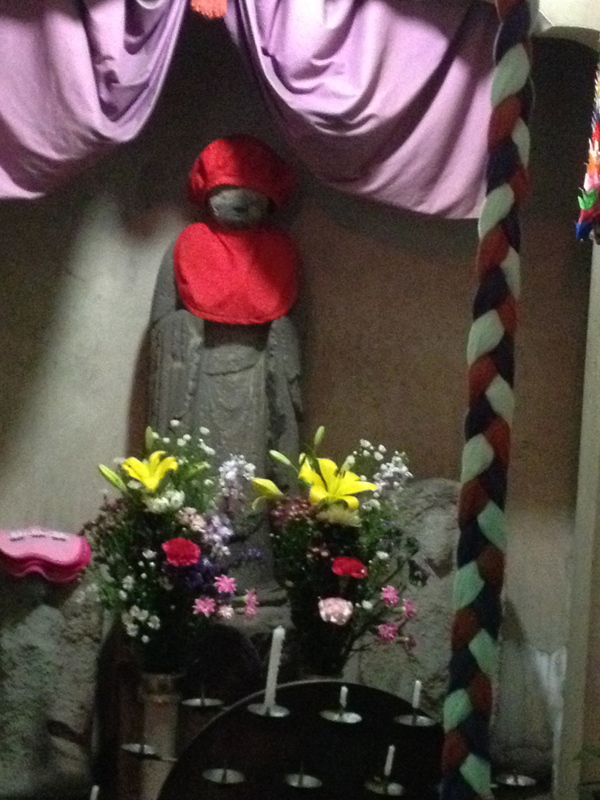 There is a Shinto shrine across the road from the capsule apartments where we stay in Tokyo – ancient stone statues of local deities all pocked and weather-worn, topped with cherry red hats and bibs. Fresh flowers, fruit, and an opened plastic bottle of water adorns the altar and the bell clangs often as people pay respects as they pass. 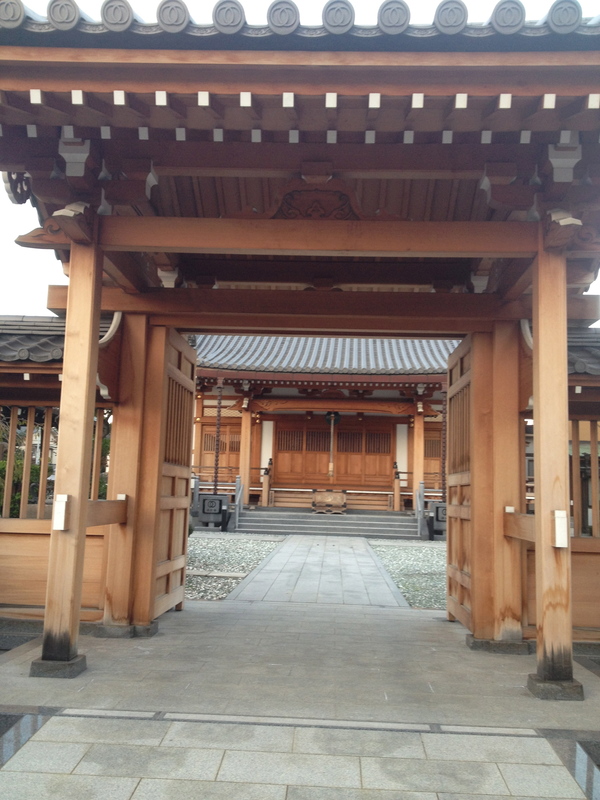 Another Shinto shrine is on the single track road winding through the individual homes and a housing complex near to Babylon Theatre Tokyo, where we work. Each day walking to the theatre is a reminder of how close the ancient, spiritual and sacred is to the surface of this fast, digitalised, ostensibly modern life. For the past three days Phillip Zarrilli of The Llanarth Group has been leading a workshop in his approach to actor training with Ami theatre, our hosts, and students from Sophia University. 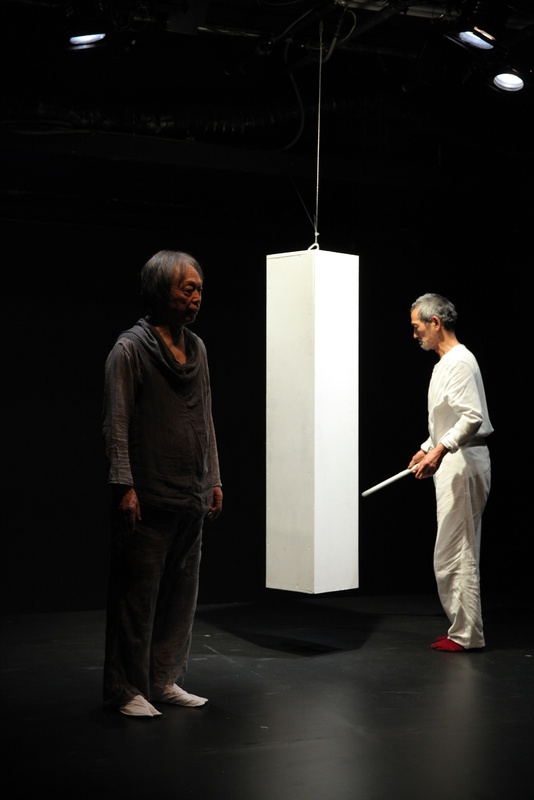 It is part of the cultural exchange supported by Daiwa and Wales Arts International between the two companies: we present ‘Told by the Wind’ later this week and then Okamura Yojiro of Ami Theatre will share some of his company’s process with us. Phillip Zarrilli and Okamura Yojiro, Babylon theatre Tokyo. 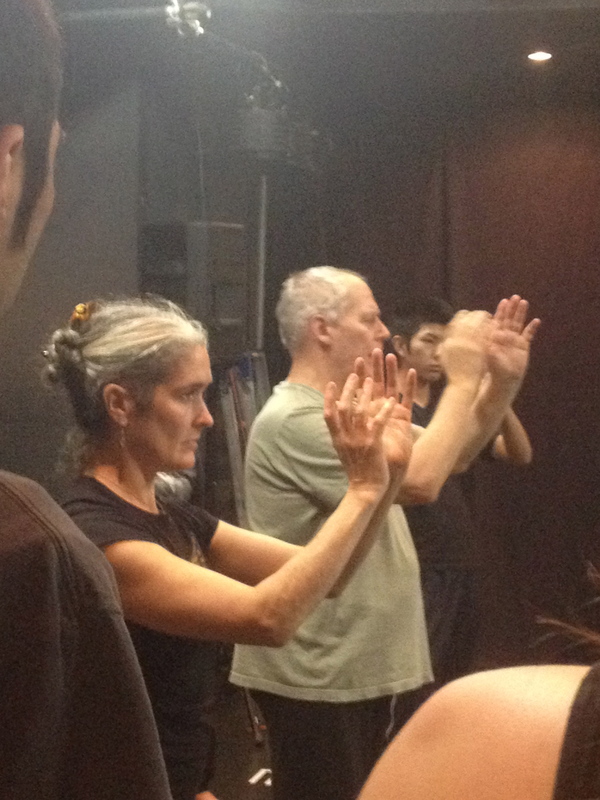 Zarrilli uses South and East Asian martial arts and yoga to train actors, starting the workshops with breathing exercises focussing on initiation, process, and completion. The first non-Indian to be honoured with master status in Kalarippayattu, the martial art of Kerala, Zarrilli claims good martial arts practitioners and actors are similar, in having 360 degrees awareness and a sense of everyone in the room. He quotes a Malayalam folk term about the practice: ‘the body becomes all eyes,’ which goes some way to explaining why he uses the training with actors to start initiating this awareness. 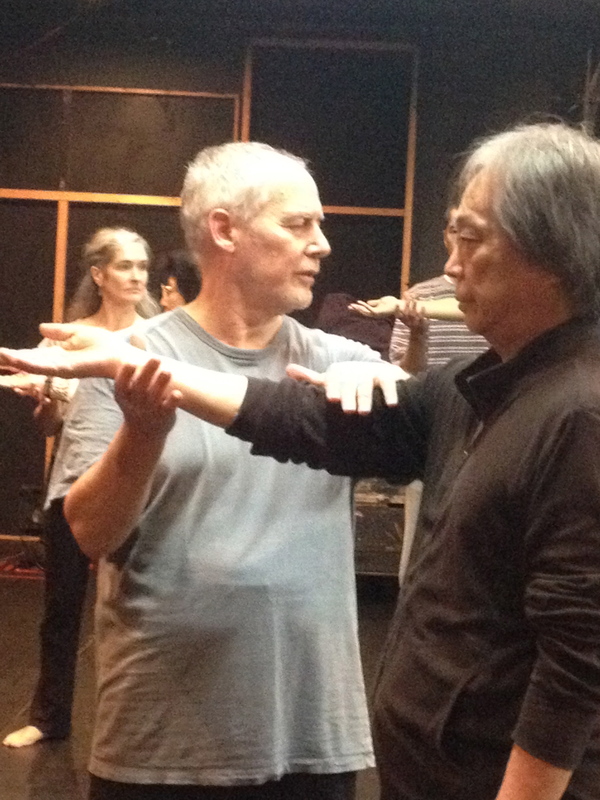 His work is all about activation, awareness, the active imagination, and focus – and one of the first of many parallels between West and East approaches to performance appears: he quotes Zeami, the fourteenth century co-creator of Noh Theatre, encouraging the students to take the opportunity to get inside their bodies through the work and not just in their heads. Such training and body awareness allows respite from the ‘squirrel-like minds’ – busy, busy – of the young actor; a wonderful energy, but totally unfocused and a mess. Okamura San listens quietly to the translation, smiles at the mention of Zeami, then nods his head.